The tiny village of Swan Quarter sits perched on the northeastern extreme of Swan Quarter Bay and is the county seat of Hyde County. Among the many quaint, sleepy communities along the North Carolina coast, Swan Quarter is one of the quietest and friendliest. Take a moment to stroll the village's lovely lanes. You will discover that time has passed pleasantly here. 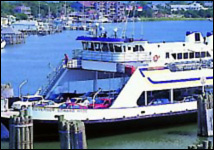 Swan Quarter boasts the only facility catering to cruising boaters on southern Pamlico Sound. Clark's Marina overlooks the northern banks of the canal running east-northeast from flashing daybeacon #10. Approach depths are 8 feet or so, but caution is required to avoid the surrounding shallows. Boaters can expect 6½ to 8 feet of water at the marina docks. You will spy Clark's dockage basin to port as you cruise upstream on the canal. Most of the fixed wooden slips are covered, but there are enough open spaces for a very few sailcraft. Water and 30-amp power connections are available at all berths. The marina's fuel dock, office, and variety store flank the canal's northern banks several hundred yards upstream of the dockage basin. Both gasoline and diesel fuel are available here. The variety store is surprisingly well stocked; fresh seafood can often be purchased. There is currently no restaurant operating within easy walking distance of the Swan Quarter waterfront. Michael's Munchies, a convenience store/grill that offers breakfast items, sandwiches, and a daily lunch special, is located on N.C. 45 approximately 1 mile from the downtown business district. I suggest you purchase some of the ultrafresh seafood often available at Swan Quarter Harbor or the Clark's Marina store and have a fish fry in your own galley. Though located on the mainland, Swan Quarter has the flavor of the Outer Banks. Established in 1812, the village was named for the many swans that once frequented the bay. 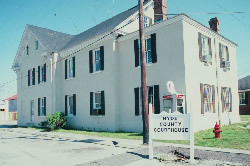 The town became the seat of Hyde County in 1836. Before eastern North Carolina enjoyed a good road system, there was much travel across Pamlico Sound from Swan Quarter to Ocracoke. It is likely that in those days, the village felt closer to the Banks than to Washington or Bath, even though those North Carolina towns are geographically closer. Fishing, oystering, and crabbing have long been the principal occupations of Swan Quarter citizens. This salty duty is supplemented by farming the rich land about the town. Today, the village sees many more visitors than in times past. Tourists pass through on their way to and from the Ocracoke-Swan Quarter ferry, located nearby. The increased traffic doesn't seem to have changed the town much, however. Sometime in the 1870s, the good citizens of Swan Quarter decided that it was high time to build a church. Various local craftsmen offered to donate their services. All that was needed was a lot on which to build. After a diligent search, a prime parcel was decided upon, and representatives of the future congregation went to call upon the owner. Much to their dismay, he courteously but firmly refused to sell. A second lot was chosen. Soon, the proud new structure began to take shape. Just as the church neared completion, a terrific storm struck the North Carolina coast. The screaming winds backed more and more water into Swan Quarter Bay, flooding the town. The new church actually floated off its foundation and proceeded "before the wind" down what was the main street. After colliding with the general store, it eventually came to rest on the lot the congregation had first chosen. Apparently seeing the hand of providence, the owner ceded the property to the church. Not long afterward, Providence Church sat atop a new foundation on its chosen land. Today, a new brick structure has replaced the original building, but the old church that floated down the street is still used for Sunday school. If you are interested in visiting the church, walk north along the main road and you will see the new brick structure on the left. The old church is just behind it. Swindell was granted a U.S. Post Office on February 6, 1830, and its first Postmaster was John Swindell. The name was changed to Swan Quarter on January 14, 1839, and its first Postmaster was Green Bringman. The Post Office Department unilaterally changed the name to Swanquarter in 1894, but the local citizens forced it back to Swan Quarter soon thereafter. It has been in continuous operation ever since inception.